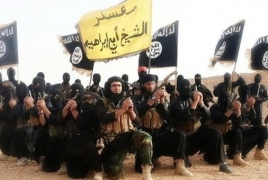 PanARMENIAN.Net - The Islamic State launched a surprise offensive in the Deir ez-Zor Governorate on Friday, August 17 night, targeting several areas controlled by the Syrian Arab Army (SAA) and US-backed Syrian Democratic Forces (SDF), Al-Masdar News says. According to a field report from Deir ez-Zor, IS attacked the SDF’s positions near the Al-‘Umar Oil Fieldsin an attempt to retake the area. Following their attack on the SDF’s positions, the Islamic State struck the Syrian Arab Army’s defenses in the Sabikhan Badiya area, which is located just west of Albukamal. The clashes in east Deir ez-Zor stopped on Saturday morning after the Islamic State seized several points from both forces. ISIS is now working to secure their gains, while awaiting a counter-offensive from both the SDF and SAA.